Step 7: Wrap the mattress properly. Before you learn how to disassemble a bed frame, you first need to remove all pillows and bedding from the bed. Strip all the bed linen, and thoroughly wash and dry all bed linen, before carefully packing it away. Linen, pillows and doonas should be packed inside sturdy moving boxes, custom designed and built specifically for this purpose, or in plastic tubs with clip-on lids. While it might be tempting, never pack linen or bedding inside plastic bags—these tend to sweat, creating a moisture build-up that is likely to cause damage. 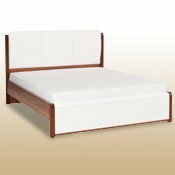 Most beds are made up of five separate pieces: the main bed frame, the headboard, the footboard, the base (or box spring) and the mattress. The next step in moving a bed frame requires that you remove the mattress and the base. This will make dissembling the headboard and footboard from the main bed frame far easier. When unscrewing the footboard and headboard you need to make sure you keep track of where every screw or bolt goes. A good way to do this is to mark the top of the screw or bolt with a number or piece of coloured tape, and then mark the corresponding hole in the same way. You should also make sure to re-screw washers and nuts back onto bolts and screws to ensure they don’t get lost or mixed up. If your bed does not have a base, chances are it will have slats to support your mattress instead. As such, when it comes to knowing how to dismantle a bed, you need to know how to remove the slats from the rails. If your slats are joined together, you may be able to simple roll them up and continue moving your bed frame. If not, you will need to unscrew each slat individually. Once again, we suggest that you keep track of which slat goes where by using a numbering or coloured tape system (as mentioned in step 3). Nothing is more annoying than losing a screw, nut, bolt or a washer. So, once you have clearly marked which screw goes where (as per step 3), place all these small, yet extremely important, parts in a clearly marked zip lock bag. You should then tape the bag to a section of the frame where the adhesive on the tape won’t leave any damage. The best place to choose would be a section of the frame that is hidden so if the tape causes any damage it won’t be visible. The material that your headboard and footboards are made from will have a direct effect on the approach you take to wrapping them. If you need to know how to take apart a metal bed frame, it is important to remember that all the parts should be wrapped in bubble wrap to protect the frame from dings, scratches and dents. If you have a wooden bed frame, you should wrap it with moving blankets instead of a plastic material; the constricting nature of the plastic can damage the surface of the wood. If you want to use bubble wrap for extra protection, make sure you wrap the wood in blankets before you use bubble wrap. The mattress is the most important and expensive part of any bed. As such, it requires extra care. You may think that mattresses are quite hardy, but the internal spring structure can be easily damaged during transit. For more information on wrapping and moving your mattress read How to Store a Mattress. Follow this step-by-step guide on how to take apart a bed frame and moving your bed frame will be easy. Your bed will arrive in perfect condition at your new address, meaning you’ll enjoy a good night’s sleep and recover from your busy day of moving.